August 2011 has opened on a number of sour notes. Stock markets worldwide are tanking, American Treasury bonds are being downgraded, and the US debt ceiling has been punctured again. More scary news is sure to follow in the coming days. What can any of us do? Maybe something like the following. Let me resurrect thoughts of great American symbols and the potential for new dollars in the USA which were broached three weeks ago. Ginger (Peace) Arnold had induced me to gather a number of symbols to create a New Currency. (See her blog). Germs for the symbolic picture come from the New Flag I designed, sewed and carried across the USA 9 years ago. I have no illusions that the American nation will adopt either a new flag or a new currency, but both may be worth considering in other venues and locales. Alternative currencies are probably new to most readers. They were to me just a couple years ago. Ginger had studied the idea and passed it on to me. The basic concept has been around for a long time and has taken root in a growing number of towns and cities. Ithaca, New York, seems to have gotten the ball rolling as it became the home to a local currency called Hours. • To support local businesses, projects, and organizations. The currency only floats among members and customers. • To keep more money circulating in the area. Local currency can’t be spent far and wide. It must be paid out continually in the locale of printing. The more times it is “turned over” the more local business is stimulated. • To have a viable means of exchange beyond Federal Reserve Notes and credit cards, etc. Local currency is like a backup in case of financial disasters. They have happened in the past and may well recur. Don’t bet your Sweet Bippy that the greenback will always be readily accepted or worth the figure printed on it. • To show community solidarity and keep faith in the local economy. The big cities and big businesses don’t need more money. It is smaller communities and Mom-and-Pop concerns with just a few employees which need extra boosts. All kinds of governments and their dollars are looking for boosts these days. But, many of them have wasted them profligately. Maybe we can do better locally. A new currency with ever vital, tried-and-true All-American symbols seems like a good idea. Maybe such a currency would help turn the modern Need for Greed into a more truly sharing and caring way to live in the ever-changing USA. 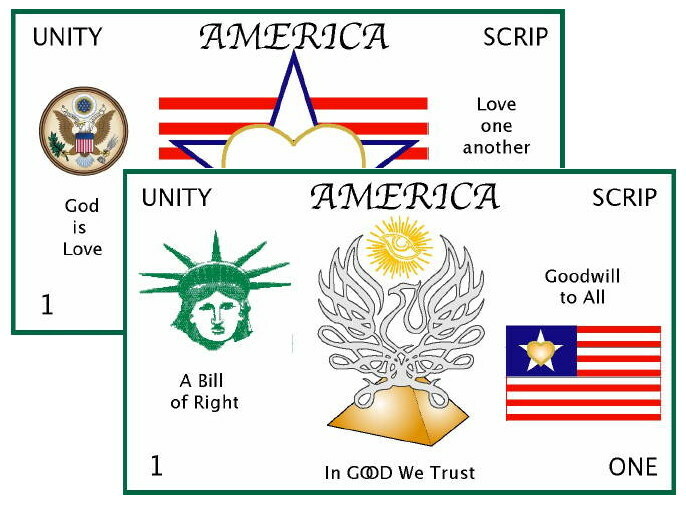 In a previous eletter, I gave my version of an functional meaning for the word America, that being I Love Richly. If we really believe in dollar bills and currency and the related symbols on them, maybe we will pass them on more generously and more consciously intending true prosperity and well-being to those with whom we do business. Ithaca Hours - one of the first alternative currencies in modern times - 1991. BerkShares - dubbed a 'great economic experiment' by the New York Times - 2006. General Information on Alternative Currencies - Now.